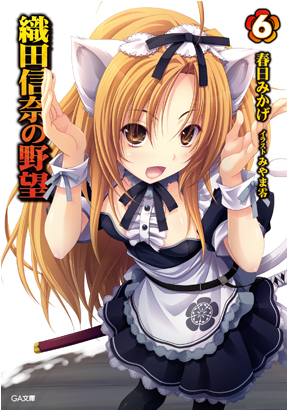 @Sumeragi: I love Nobuna, so I love all the cover about her, especially if there is yukata. 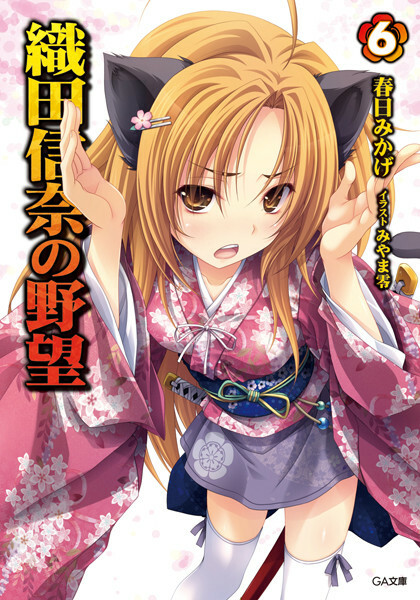 Nobuna look so beautiful in yukata and with cat ear's makes her look cute. The cat ears exist because of the story, which I'll just keep to myself for now. Hm~, I must read it immediately after finish SAO. In which I'd ask because I'm a spoiler nut. I get the feeling you just want to read the cat ears part like most of us in here. From what I understand, he doesn't kill because he isn't used to it (being your average Japanese high schoolboy of a highly undermilitarized Japan). However, he will put his life on the life to save others. So if we compare him to Rock, his reluctance to kill is based on not having the guts for it, and not an issue of principles. Back then killing someone was harder, nowadays any punk can pull the trigger of a hand gun and kill someone without any effort or premeditation, back then it required real skill with a blade (which he obviously lacks) and having your mind clearly set on that goal. It is not a surprise that he can't kill, especially where he grew up. The typical teenage boy in any place in the world does not have the experience of killing someone. Putting his life on the line is a different story, comes from being love with someone or caring for someone. Cliche yes, but it is amiable. Not sure, but anime cut off few things I think. What is different so far from the anime it doesn't look like a Harem, though the Light Novel is. Actually, no. The light novel and anime are relatively close to each other (same feel unlike campione or Hague). The harem aspect is about the same in both. There are girls who will like our mc, but his heart is set on Oba. Think SAO. There are other girls who like the mc, but he remains faithful to Oba. I haven't seen much of a harem yet in the anime. Oba so far has been the only one that has clear notice of affection for him. Though like all things, they can change pretty fast. No, my point in the first place is that even the light novel is not really a harem. Sure, there a few girls who like him (and even more in volume 6), but throughout it all his heart is dead set on Oba. It's similar to SAO where lots of girls like the mc, but he is set on Asuna. That already fulfills the definition of a harem, supporting harem, if you want to be specific.Also, it doesn't change the fact that the mc wants to have a harem like the real hideyoshi. As mentioned in the first novel, the mc promised hideyoshi that he would fulfill his dream of assembling the most beautiful girls of the land into his harem. That already fulfills the definition of a harem, supporting harem, if you want to be specifically. I guess so. I just don't view that as a true harem. In the real world, I would just prefer to think of that person as a popular or charismatic person. On other hand, if one guy simultaneously hordes 5 girls without settling on anyone, I would definitely see that as a harem (assuming all the girls agree to this type of relation). I would even consider blockheads like Ichika in IS as having a harem because even though he isn't mentally aware of the harem around him, he is actually enjoying the semi-relational benefits (non-sexual) of having all the girls like him. The mc in Oba is a bit different from the previous two cases. He is aware of his situation, but he never capitalizes on it (Volume 6 is the prime example) because there is always Oba's voice in the back of his head, which unconsciously keeps him very well in check. It's not that he doesn't want to establish a harem, it's just that he's too loyal to Oba. If he acts like Keiichi does in Ah My Goddess, I would agree with you, but he is not. He is being temped by other advances and the relation between him and other girls are also ambiguous in the way that is similar to say Love Hina that includes many physical interaction and fantasies on his part. But really, I just love this series because of the historical element in it and how the series slowly shows the effect an outsider has in timeline. Though with that being said, I still think this timeline will turns out to be a paralleled timeline rather then an actually history-altering series when it is all say and done. I also can't wait for the introduction of Date, that chapter is of my favorite so far. The anime adaption is pretty good so far, and the LN is now officially licensed in Taiwan which mean I now got another series I can officially own. It's just his true nature, or ... men nature, I dont think it lead us to love or something like that. Well, but I do not deny it's an harem since he wanted to make the kingdom full of woman. Last edited by BTDK; 2012-07-19 at 04:22.